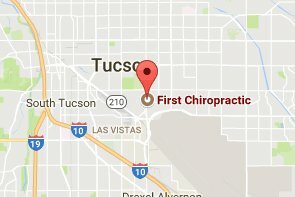 We have 6 Tucson locations and offer same day appointments! At First Chiropractic we have the knowledge and experience to treat your pain. We have 6 Tucson locations. Quickly find the one closest to you! We treat auto and work injuries, neck pain, back pain, sciatica, and more! Most insurances pay 100% of the cost of care at First Chiropractic. 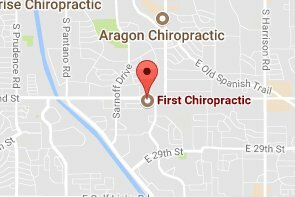 At First Chiropractic we pride ourselves on being top rated Tucson chiropractors and we make caring for our patients our highest priority. That’s why we offer locations throughout the city of Tucson to make sure our patients can receive care when they need it. Because of our many locations we can usually offer same-day appointments. Every location has on-site x-ray capabilities and our Tucson chiropractors are preferred providers for all major health and auto insurance plans. Most auto and work injury patients pay nothing out of pocket for care at First Chiropractic. Below lists some common injuries treated with chiropractic care. 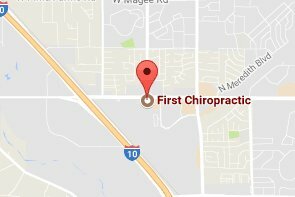 For more information about how chiropractic care may be able to help you, contact us at one of our convenient locations nearby. Overcome weakness & enhance muscle tone. Speed up overall recovery time. Diminish chronic and recurring conditions. 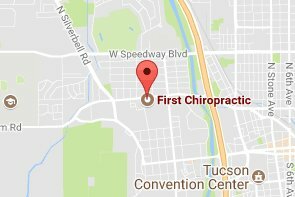 First Chiropractic of Tucson has helped thousands of patients recover from their injuries. We have a broad range of treatment methods to help relieve physical problems and improve your movement so you can live a fuller, more active life. 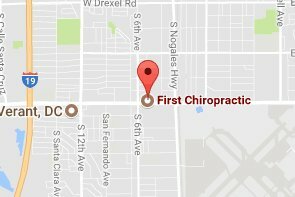 If you haven’t seen a chiropractor before, we can walk you through the process and explain the various techniques that have a proven record of effectiveness for relieving pain and improving function. Our trained staff will ensure your comfort and convenience. We speak Spanish (Se Habla Español) and are Affordable Care Act compliant. If you are experiencing weakness, lack of flexibility, poor coordination or chronic pain, contact us at one of our many Tucson locations for an appointment to learn how chiropractic care can help. 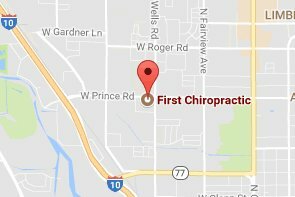 First Chiropractic accepts attorney liens. In addition, we have a network of health professionals and specialists that can provide additional services on a lien. This network includes orthopedic surgeons, medical doctors, neurologists, certified radiologists, MRI's and CT scans. Most patients at First Chiropractic pay nothing out of pocket for care provided at First Chiropractic.